If you are looking for a cloud backup software,Backup Cow can meet your needs.Backup Cow,which can build a private cloud for your backup tasks in your office via LAN or intranet networks. Try Backup Cow to build your own private cloud storage! The world has come into "Cloud" age ,which becomes more and more popular around people.As the development of technology,cloud storage is more superior than other storage tools.Cloud Storage is based on cloud computing,it is the extension of Distributed Computing,Parallel Computing and Grid Computing.People like to work with convenient infrastructure because it can save time and money. How to build a private cloud with Backup Cow ? Cloud Setup is easy. To make your own private cloud, you just need run Backup Cow Server program on each computer that you desire to use as a cloud server. And all these cloud servers will connect together automatically to create private cloud storage for your own use within your organization. How to backup files to the cloud servers after building a private cloud ? After building private cloud storage, if you want to backup files from other PCs to the private cloud, you only need to run Backup Cow Client program on the client machine, and sign up and log in the private cloud from the client program. Then you can backup data from the client PC to the private client. What benefits can you get from Backup Cow? If you are an IT manager,you may feel depressed of millions of files and data in your office PC.Hard disks,hard drives and USB storage may cost you lots of money and limit your storage.However,Backup Cow can make good use of under-utilized computer hard disk with its private cloud storage builder.Therefore,with Backup Cow ,you can save much cost on IT infrastructure and gain more powerful utilized . Backup Cow has the feature that allows you auto synchronize data with the pre-set time interval.Thus, you do not have to backup and sync by your own self ,which is more convenient and more satisfied. With the development of economic,people will concern about the safety of data.Sometimes ,other storage may leakage your data.Backup reliability and security are very important issues that you must consider when you choose backup solution. This cloud backup solution enables you to build backup cloud storage internally for your important files and sensitive data. You don't need to pay any online cloud backup solution providers to store your data outside your organization. You can backup your computer files with more than one copy. With encryption and privacy features, Backup Cow will protect your files from being viewed by other users. You can transfer files to the private cloud by using MD5 file verification to enhance data transfer reliability. 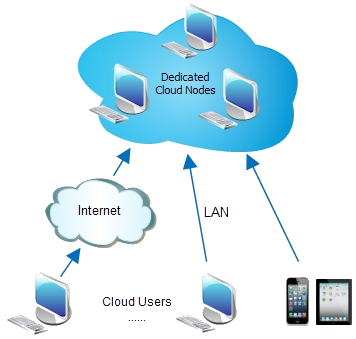 In addition, you can set a security ID number for your private cloud computers so that any network users who don't know the ID are unable to connect to your private cloud. Download Backcup Cow for permanent trial !